For as long as humankind can remember, dogs have been said to be man’s best friend; and they’re often a happy, tail-wagging addition to our families that we couldn’t imagine living our lives without. Dogs provide us with an endless amount of companionship and joy. So, for the love of dogs, we’ve compiled 23 unique doghouse ideas to keep your furry family member safe, comfortable, and stylish. By the way, you’ll see a lot of dogs in this article… try to focus on the doghouses and not their cute faces (we know, it’s hard). This wooden doghouse complete with a covered front porch is perfect for the dog who likes lounge in the shade or watch storms (without getting wet, of course). It’s incredibly well-made with beautiful wood and would go great in any backyard without cheapening the look of your outdoor space. We thought this doghouse, though simple, was absolutely worth putting on our list of doghouse ideas. How could we not with that tiny doggy front door? The front door not only has a doorknob, but it swings back-and-forth like an actual home door which is just so cute when you think of your dog having his own little human house. This colorful doghouse is simply perfect for the playful pup. The brightly-colored orange and blue tiles are different than any other doghouse we’ve seen, making a great addition to the vibrant pet owner’s backyard. 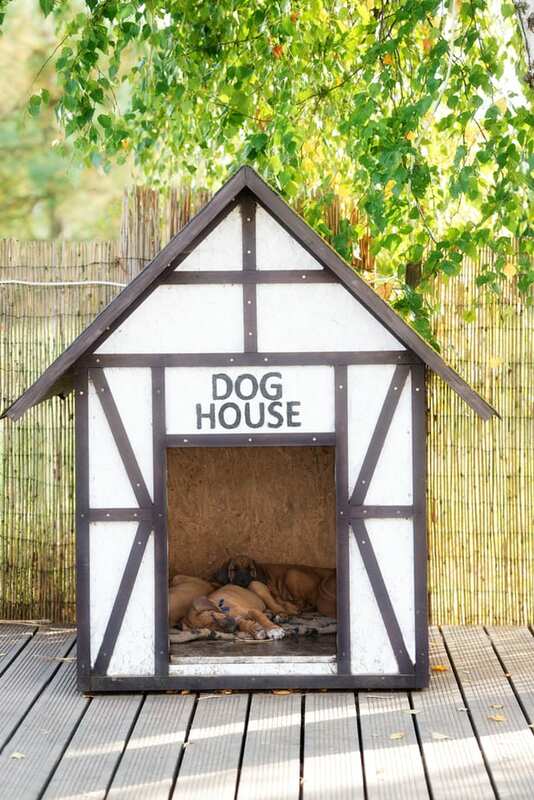 This doghouse is probably best suited for the incredibly… ahem… enthusiastic dog owner. The huge scale of this cabin-style doghouse, complete with a house light and windows, is perfect for those with lots of dogs (or one really pampered dog). No one can ignore the cuteness of this little puppy home. With the adorable cartoon bone, and “Dog’s Inn” sign, this doghouse is the ideal home for your pet. The “Dog’s Inn” sign is unbelievably clever, but rest assured a sign more suited for your pet would likely be just as precious. If you happen to have a spotted pup, this easy-to-make Dalmatian-style doghouse would melt the hearts of every guest that comes by. Simply paint an average doghouse white (or any variety of colors to match your pet), brush on a few random spots and voila! You’ve got yourself a dalmatian doghouse. For the flower child in you, this hippie-style doghouse is perfectly suited for the colorful backyard and free-spirited puppy. This would be a fun art project for those who love the odd and animated look of exaggerated flowers and rainbows. The design of these angled-roofed booth doghouses is great for the dogs who spend time in chilly weather. 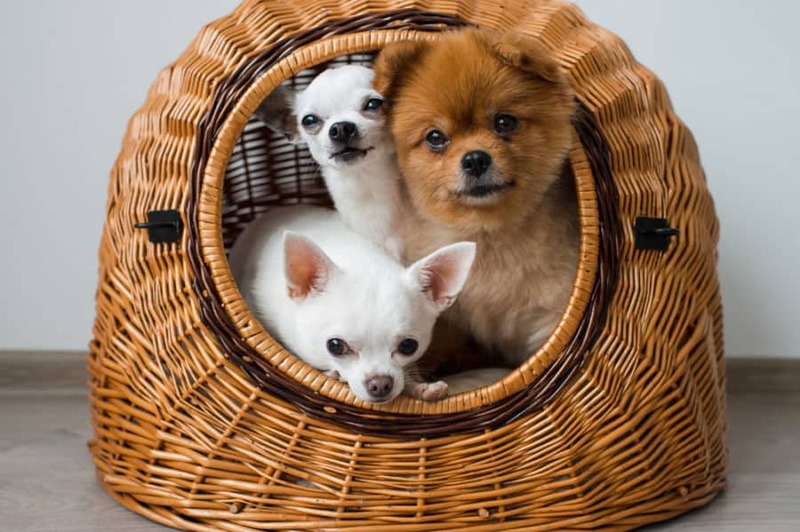 Like in the photo, the entrance is to one side of the doghouse (rather than in the center) so that your pet has a pocket of space protected from the elements. Even though this doghouse is more protective than others, keep in mind that it’s best to bring your pets inside when the weather becomes too harsh. This doghouse is a more permanent solution for shelter for your dog. The brick is a beautiful style and wouldn’t take away from the sophistication of a yard. 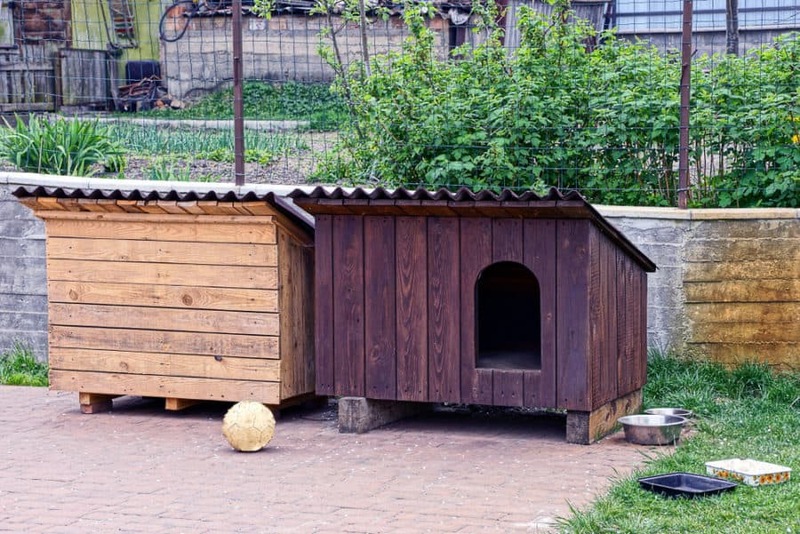 A doghouse like the one in the photo would surely be insulated better than open-door, wooden doghouses; which is great if your pet has to stay outside often – and during the summer, the door could be left open for air circulation. This doghouse decorated with a miniature staircase, flower pot, and flag is home to a proud Swiss puppy. Whether your dog will be flying Old Glory in her renowned Red, White, and Blue… or another flag of your choice… this tiny replica of a human home is a clever addition to the backyard of any patriot. This doghouse and kennel combination is a great way to temporarily house your dog when you’re away or having someone look after your pet. The combination allows for extra coverage from the elements and provides a space for food and water. Not to mention the concrete floor of this pen makes the kennel easy-to-clean. The cutesy, dollhouse decor of this A-frame doghouse would look darling in a colorful garden. Not only would this precious doghouse enhance your garden, but it would compliment a small dog perfectly. (Seriously, could you imagine a fluffy Pomeranian living in that little fairytale house? Adorable). Is it that time of the year again? When Christmas rolls around, decorating your pets’ doghouse with wreaths, lights, and other Holiday decors is a paw-some way of celebrating the season. 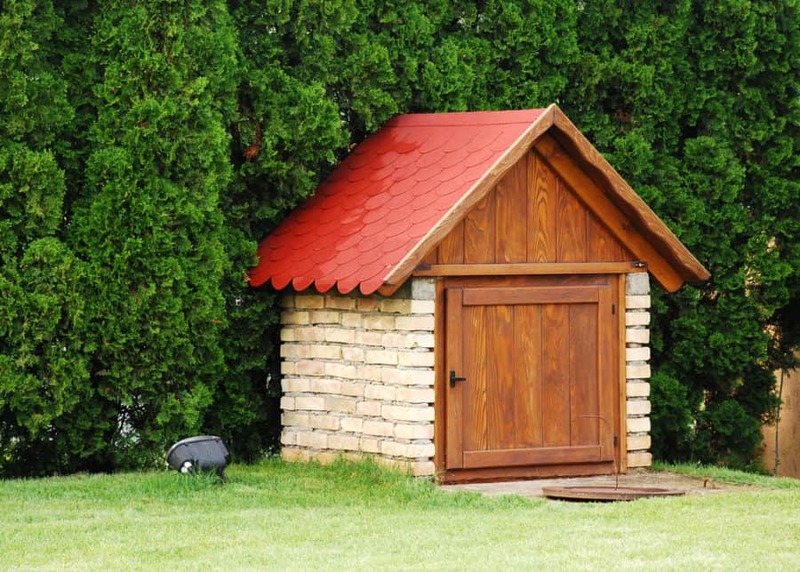 If you’re a fan of Tudor-style homes but can’t have one of your own, building a Tudor doghouse may be a close second. 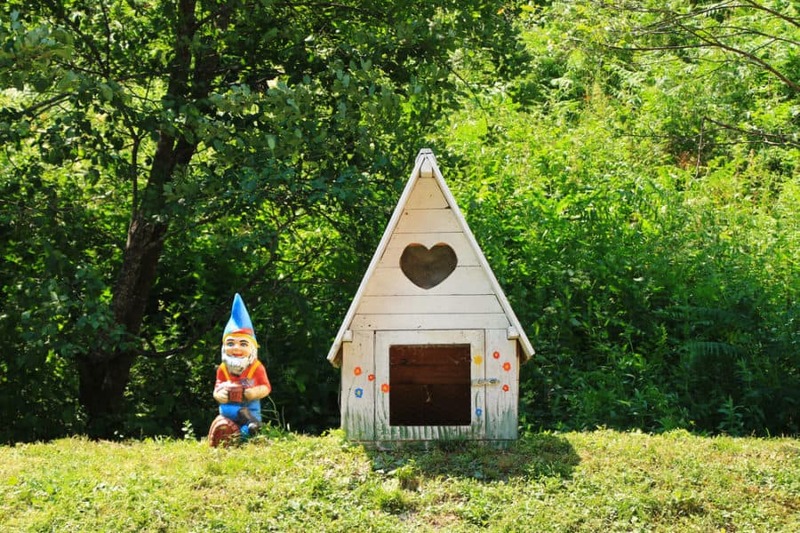 The eye-catching European style of this doghouse is sure to stand out in your yard. Toto, we have a feeling we’re not in Kansas anymore. This wicker basket doghouse not only brings back memories of the Wizard of Oz, but it’s also a unique little home for your pets to rest in. Of course, this doghouse isn’t one you’ll want to keep unprotected out in the elements. If you do happen to need it for outdoor use, be sure to keep it under an awning or covered porch. This A-frame doghouse was built along with an awning to protect the head of a curious dog from the elements. Not only will the awning on a doghouse protect your pet when they want to look outside, but awnings keep snow, wind, and rain from taking over the inside of your pet’s home as well. If you happen to live on a farm or in the country, this rustic doghouse could be just the thing you and your pets are looking for. 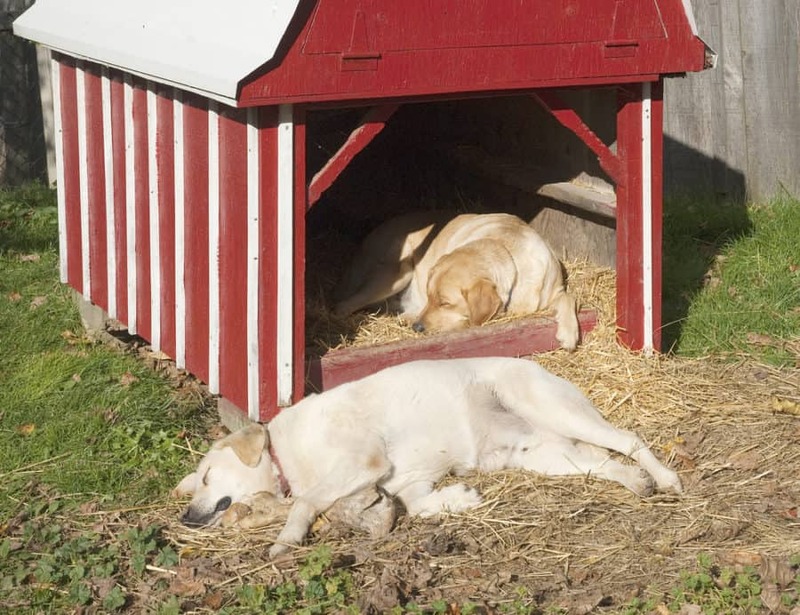 The open entrance and wide floor make the perfect home for your pups to lounge around in on a warm, summer day – and the red and white barn look is perfect for enhancing the Southern style of your property. Igloo dog houses are large, igloo-shaped doghouses with an extended doorway to prevent weather elements from getting into contact with your pets. These can be purchased at virtually every pet store (or on Amazon) and are easy to put together. Additionally, they’re often ventilated and made of lasting, durable materials to keep your pet shielded and comfortable. 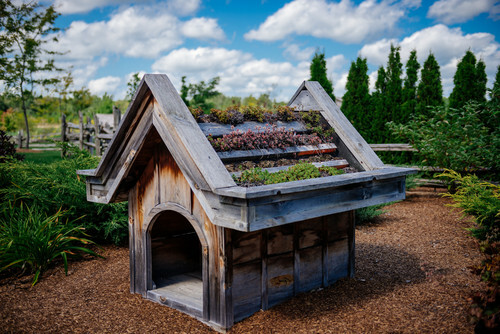 This doghouse with a rooftop garden was a feature that we included in our 70 of the Best Backyard Design Ideas article. We love it so much that we had to include it here, as well! Not only would this doghouse protect your pet, but it would surely bring vibrant floral colors to your yard (or put delicious edibles onto your table)! With the simple metal roof and circular entrance, this doghouse looks just like a birdhouse you’d see in the trees. If you’re a bird and dog lover, adding a dog-sized birdhouse (along with your bird-sized birdhouses) to your yard may be an adorable addition. Though this modern doghouse is (quite obviously) not suited for use in the outdoor elements, it’s still a cute and trendy doghouse for your pets. This doghouse is unique and in-style, adding a contemporary look to any area you place it in. Just be sure if you’re putting this doghouse outside that it’s protected from the weather by something such as a covered patio. 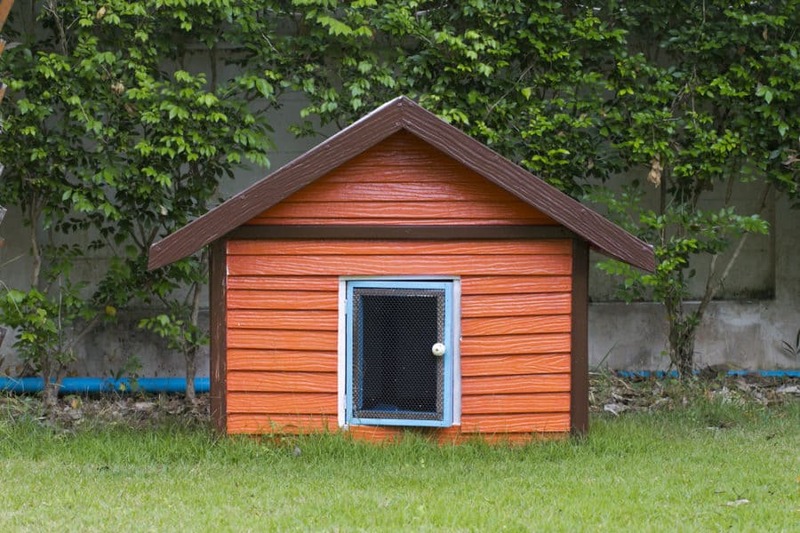 If your style is up-to-date, take a look at these other modern doghouse ideas. For all the Snoopy fans out there, this cartoonish replica of Snoopy’s doghouse is one of the most innovative doghouses we’ve come across. The reminiscence of childhood that comes with this doghouse is enough to make anyone smile and bring the world of Peanuts to reality. 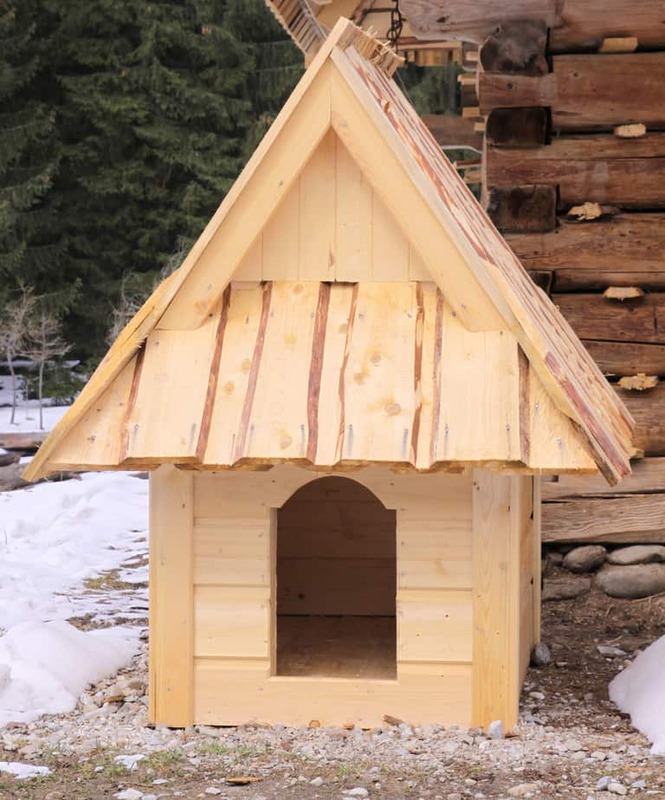 This low to the ground, den-like, wooden doghouse with a small entryway is perfect for keeping your pets warm and feeling safe. 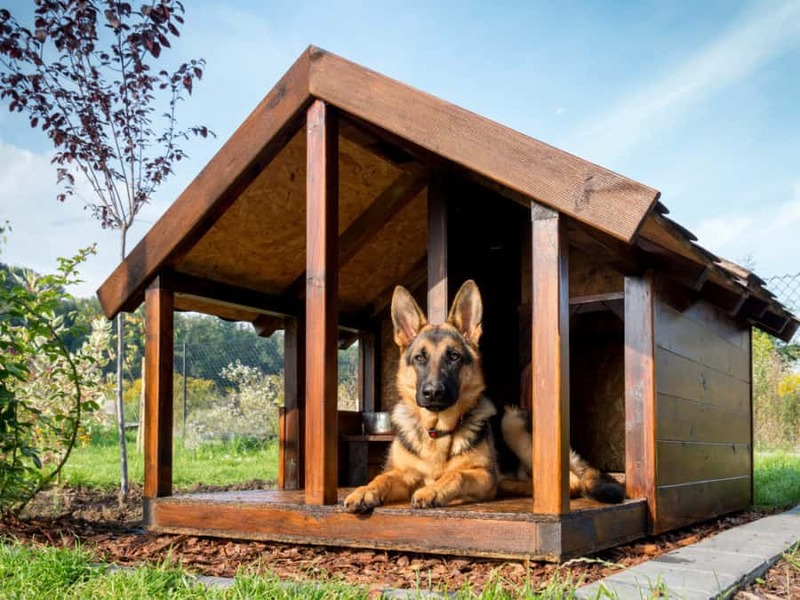 Dogs are known for feeling secure when they sleep in small, enclosed areas – so if your pet stays outside, this doghouse may be an excellent option. Dog houses are a wonderful way to add character to your yard and keep your pets out of the elements when they’re outside. Even though doghouses can be a convenient addition to your yard, it’s important to keep in mind that dogs are best taken inside your home when weather conditions are too severe. 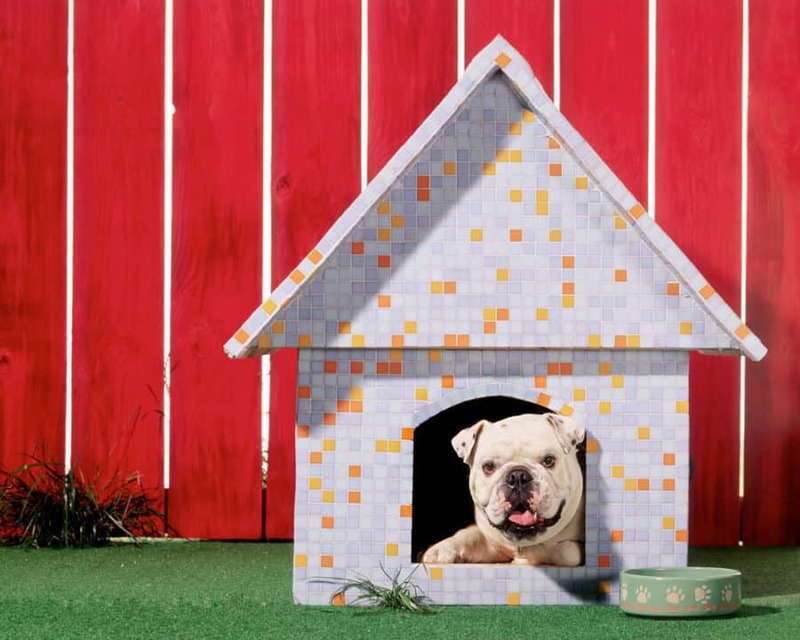 We hope you enjoyed this list of our favorite doghouse ideas! Need more outdoor design ideas? Check out our Fire Pit Ideas, Rope Light Ideas, Front Porch Ideas, and Pergola Ideas articles!